So if there’s a Fire out there and the person is in here, if this door is closed, it could get to 1,800 F degrees in the room where the fire is, but it will stay less than 100 F degrees in the room behind the fire if the door’s shut. Controlling the ember’s flow path is the goal as well as compartmentalizing the fire before flames rage throughout. The simple act of CLOSING THE DOOR can save the lives and contents behind it. In almost an instant, memories can become ash. No baby pictures or no pictures of your sister, brother, no wedding photos. The photo below shows the importance of closing a door. 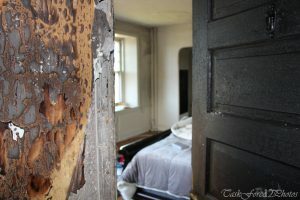 Notice the fire scars on the outside of the door that did not penetrate into the room. Fire Picture Courtesy of Beverly City Fire Department.